Twice each day, as the tidal river flows in and then recedes, it reshuffles the river bed. It erodes and exposes materials and artefacts, some of which have been lying - preserved in the anaerobic mud – for hundreds, even thousands of years. 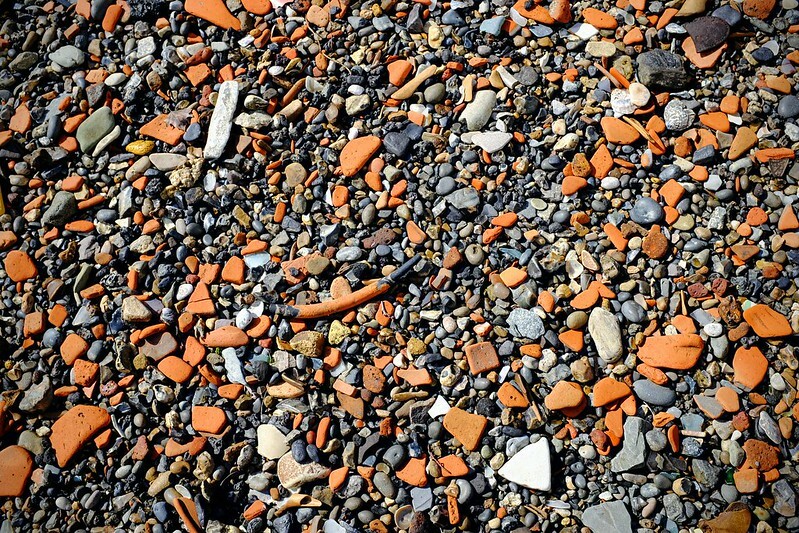 The foreshore has been described as London’s largest archaeological site. People have lived on the Thames at what would become London for at least 8,500 years, after the last glaciers melted from Finchley some 12km to the north. Although maybe we can only imagine a dense city-like habitation with the arrival of the Romans, over 2,000 years ago. The river has recorded the presence and retreat of the Romans - they were here for 400 years, then Saxons, then Normans, then the dominance of medieval royalty, and was at the centre of an industrial empire that ruled a quarter of the globe. Throughout these times, the Thames has been the main vector for delivering and processing materials, goods and people to the ever expanding city. From a distance the foreshore resembles a pebble beach at a seaside, but up close it’s smooth stones morph into eroded bricks, roof and floor tiles, concrete nodules, slates, drifts of sorted ceramic fragments, rusted metal things, clay pipe pieces, coconut shell shards, plastics, glass, oyster and clam shells, fossils and bones. Lots of bones. 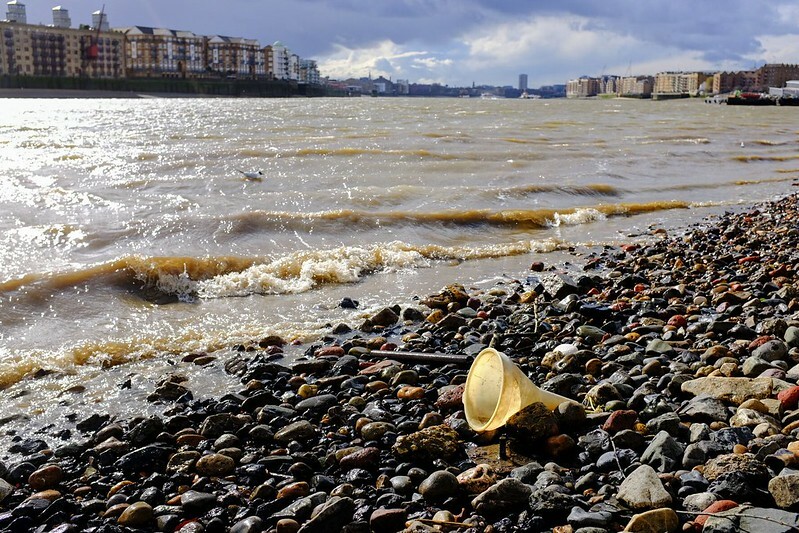 The foreshore is a time-magnified index of the anthropocene, a readable trace of our growing impact – an impact which now greatly exceeds 'natural' sedimentary production - on the most profound of temporal records, the geological layers of our planet. 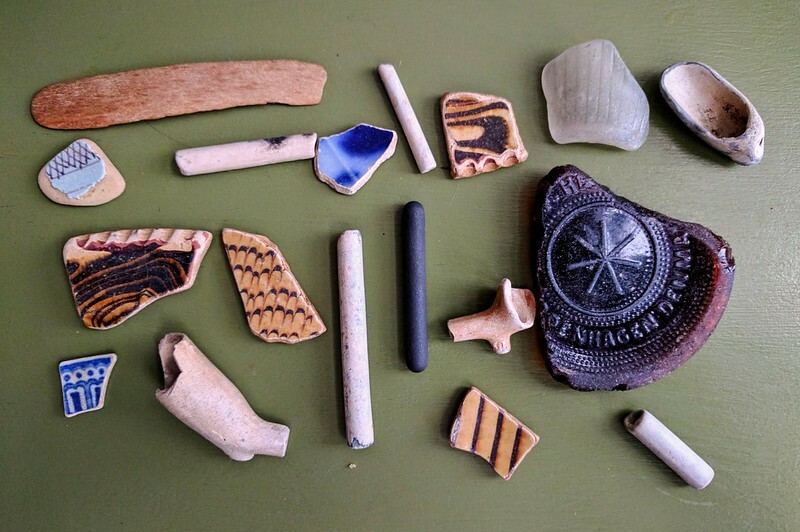 I spy a common ceramic fragment, stoneware with caramel ground slip-glaze and a chocolate combed decoration, it’s like a drawing of the waves dancing in the river behind me. The daily eroding, shuffling and sorting has no respect for linear chronology, Roman detritus is mixed with the Victorian, fossil ammonites from 80 million years ago, a time-event we call the late Cretaceous - when the shells and skeletons of billions of tiny sea creatures compressed to form the chalk strata that rises as hills to the north (Chilterns) and south (South Downs) to produce the London Basin - nestle with disposable plastic razors from the 21st century, 8,000 year old Mesolithic flint tools mix with 17 century Trading Tokens, forged iron and brass nails, and copper rivets extracted from wrecked wooden ships lie next to the plunder of Empire - evidence of the consumption of sugar, tea, tobacco, coffee, slaves and spices. Are these our erratics? I notice a thin spatula shape, I pick it up, it’s light, made of bone, scraped, shaped and sanded. Later, I think it’s whalebone, the stiffener for a corset. As I drift along the foreshore, I realise I’m standing on a beach made of bright white chalk pebbles, chalk that had been dug from the Thames basin lip, from the Chilterns some fifty kilometers away, transported to Wapping and laid down to provide a soft bed for barges to nestle on at low tide. I notice remains of wooden structures, successive generations of embankments - often constructed from Oak and then Teak heartwood baulks brought from Indonesia and back-filled with rubble; the fire, war and bomb damaged masonary of previous iterations of the city. Structures built on structures. In anywhere but the river Roman remains would be at least six meters down. I see piles of Oyster shells, they’re abundant. Oysters are one of the key components of the hybrid collectives that make London possible, they helped shape the city. The Romans loved them, building roads, markets and ribbons of trade to aid distribution. They were hugely popular in the middle ages, a staple. In the 19th Century newly exploited beds in the Thames estuary enabled the ultimate convenience food to be eaten for breakfast, lunch and supper. There are estimates that in 1864, 700 million oysters were eaten in London alone, and that three men in a sailboat could gather 3,000 in a few hours. As a child I used to holiday near Oystermouth, a village on the coast in South Wales, a village built by oysters. Although, as if in a vivid premonition, over-exploitation threatened the British oyster beds, our wastes destroyed the rich ecosystem they need to thrive in, and in the 1920’s a disease - widely believed to be Aber disease, a parasite that infects the oysters digestive tract and inhibits nutrient absorption - wiped out the remains of the industry. So, most of these shells are the fast-food waste from the mid 19th century, I glance and from the corner of my eye notice a mustard yellow polystyrene container, contemporary clam-shell packaging. Plastics litter the foreshore, taking the shape of ropes, tubing, bottles, funnels and bright, yet unrecognisable fragments. It’s well known that our myriad plastics don’t degrade on anything like a human graspable time scale. I overheard someone say that all the plastic we have ever produced is still with us, sometimes broken into ever smaller parts, reduced by sunlight into even smaller particles, ingested by by others, but still with us, and concentrating. We produce about 100 million tons of plastic annually. The tide has turned, the water is rising, I return to the stairs.